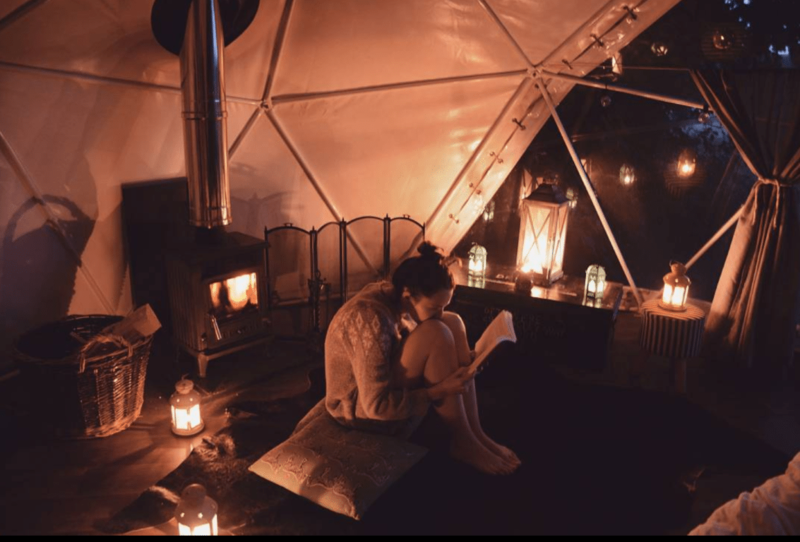 This month I finally had the chance to visit one of the best Glamping sites in the UK. Ever since I read my first Jane Austen novel it became one of my dreams to explore England’s countryside and small villages. 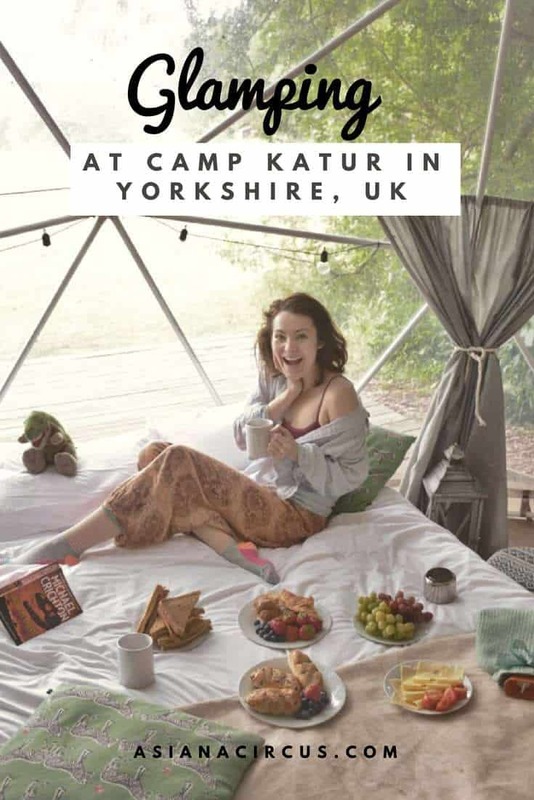 So, when a few weeks ago I got the chance to stay at CAMP KÁTUR, a gorgeous glamping site in North Yorkshire I quickly packed my bag and off I went. I have to tell you, my first glamping experience was more than perfect. Camp Katur totally got me hooked on glamping! It was a blissful and relaxing stay. Our four days were filled with nature, history, culture, myths, adventure, and delicious, traditional English dishes. Yep! You read that right! Delicious dishes because the food in the UK is way more flavorous than most people think. You just have to know what and where to find them. But more about that later… One thing is for sure; From now on I will make sure to spend more time glamping/camping. 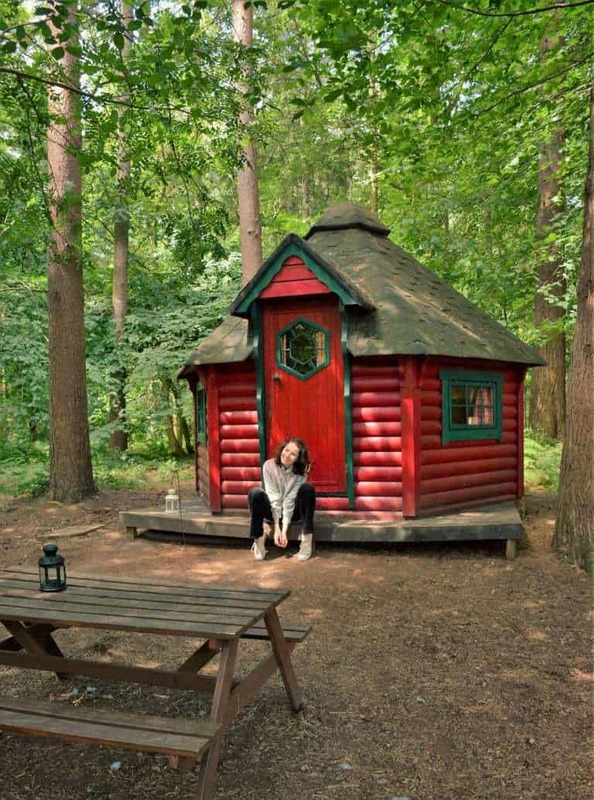 CAMP KÁTUR’s owner Kerry is a passionate wanderer and it was her longtime dream to bring glamping to Yorkshire. Her creativity, flawless taste, and hard work show everywhere. Kerry’s caring and inspired touch were easily seen everywhere around us. Her quirky but elegant ideas clearly came to life in the unique accommodation types, in the vast variety and adventurous activities, and in the stylish designs inside each tent all for our enjoyment. I think anyone who spent more than a few weeks in the UK knows that camping in England can be rough. The weather (especially during the night) can drop down drastically, finding clean toilets can be tough, -not to mention an actual shower with hot water- and while spending time in nature is always advised it’s just not as relaxing if you can’t get a comfortable good night’s sleep. Glamping gives a solution to all of these problems. You get clean toilets and showers with hot water. In some cases, they’re even private (you have to check before booking your accommodation). 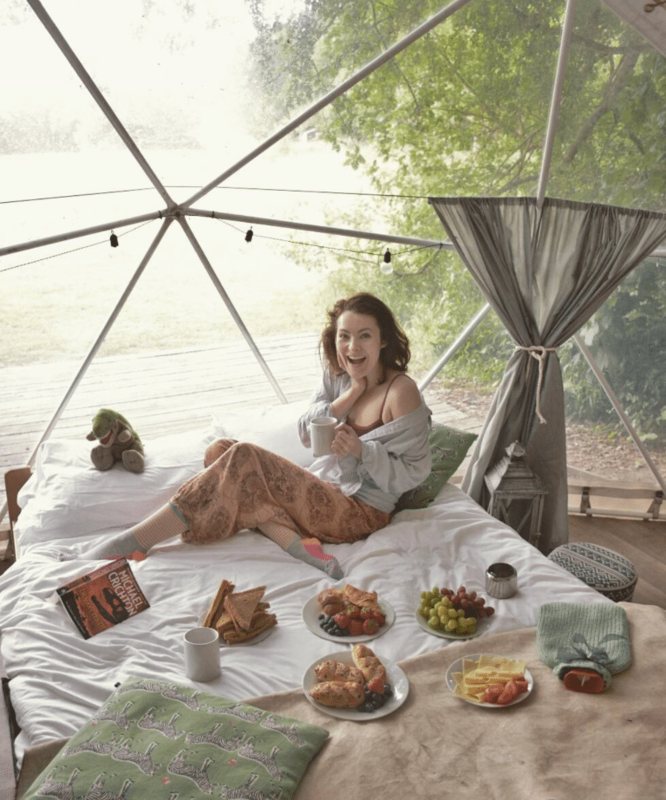 You get comfy, and beautifully designed tents, yurts, or whatever you choose to stay in. But my absolute favorite was the gorgeous log fire heating system that kept our bodies and souls warm during the cold nights and mornings. 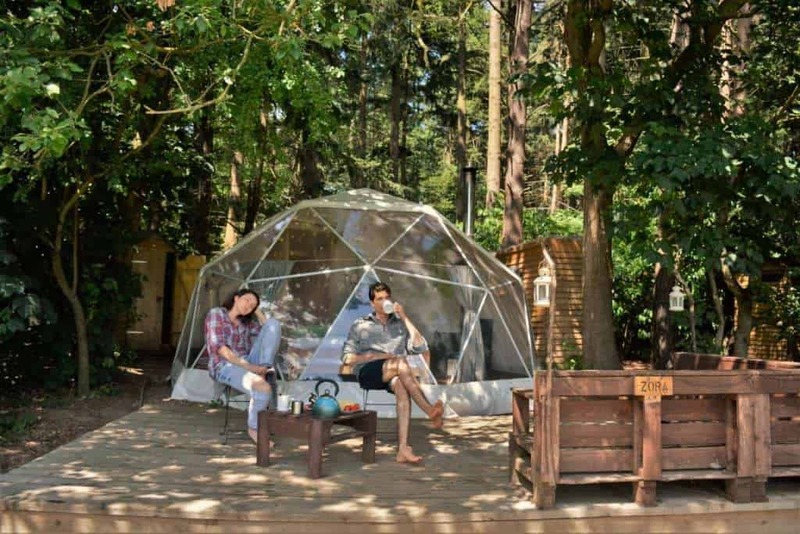 So, if you wish for a perfect yurt holiday and glamping experience you should definitely be heading to this dreamy camp. 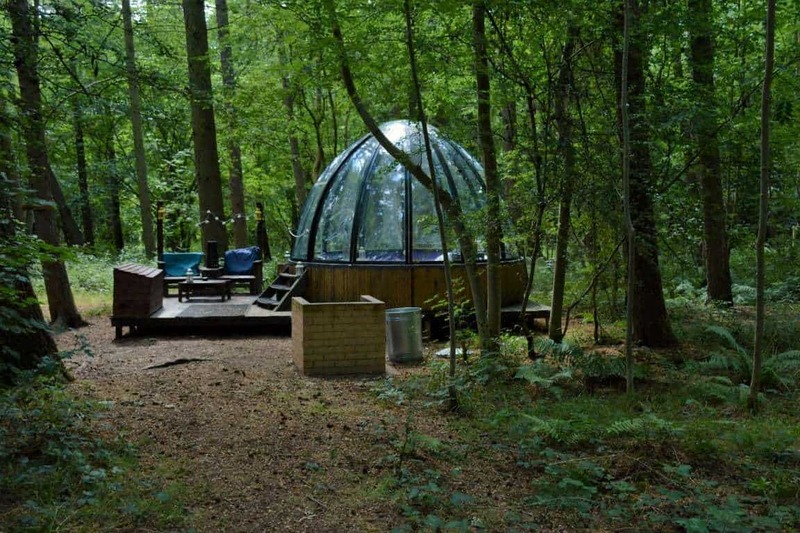 We got to stay in one of the gorgeous luxury geodomes. 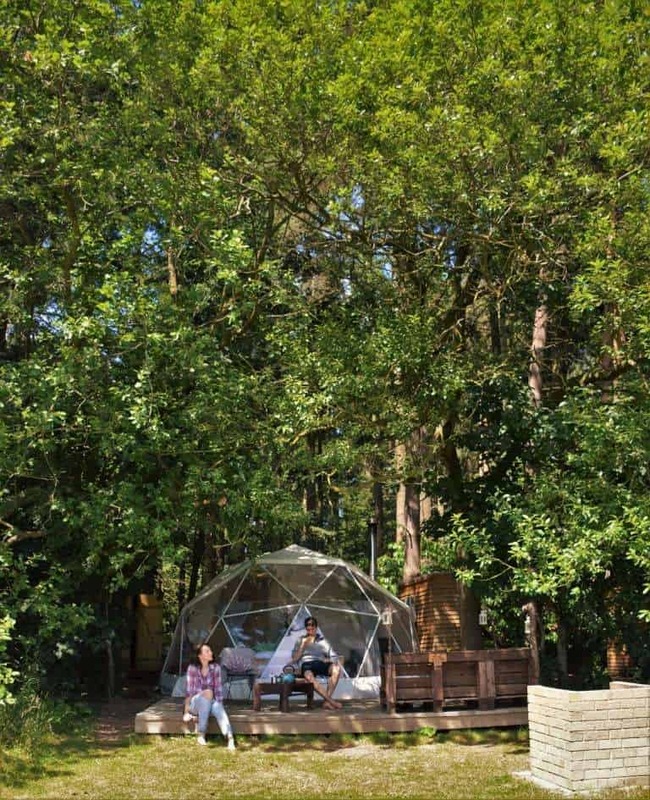 The geodome has its own kitchenette, private toilet, and hot gas shower. The front side of the geodome is completely see through so you’ll get a good look at the peaceful campsite and the nature surrounding you. 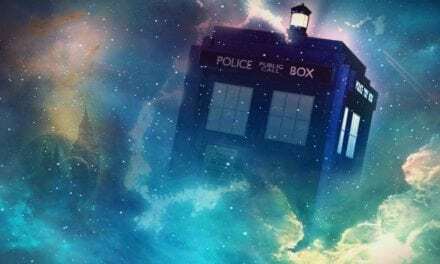 I will never forget the utterly beautiful moments when I was lying down in bed looking up, wide-eyed at the gorgeous star-filled dark sky while listening to the popping and crackling music of wood fire. Sigh. Can I go back now? While I was completely satisfied with our accommodation I felt a deep need to discover all the other options around the camp. Walking around here truly feels like falling down the rabbit hole and finding Wonderland. Only, in this case, it’s Kerry’s Wonderland and not Alice’s. I visited with my best friend Ben but I would say it’s a perfect place to visit for families, solo travelers, and even for bigger groups (+20). The camp is also animal-friendly and I’m not just talking about the beautiful horses and the cutest wild rabbits but they’re also welcoming smaller dogs and cats. Indeed, thankfully Camp Katur is a dog friendly camping/glamping site. 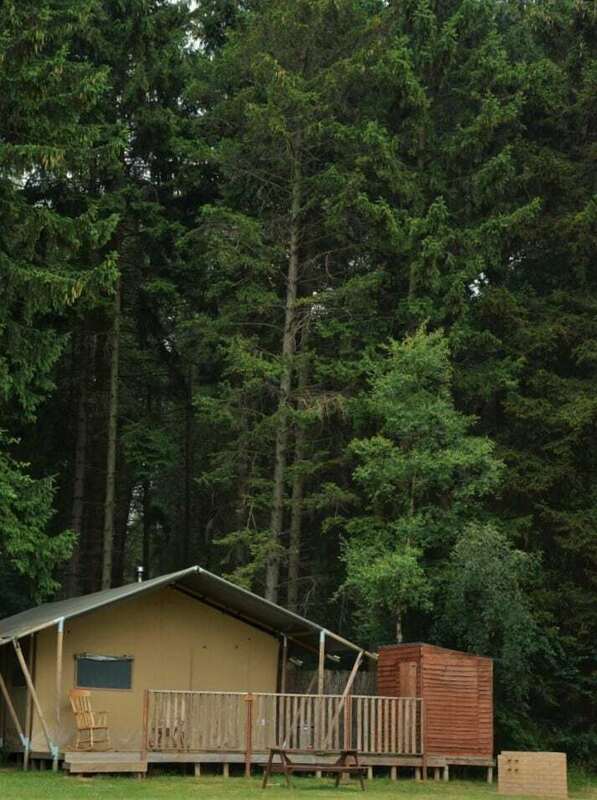 So, don’t worry you can have a glamping experience with your four-legged best friend as well. 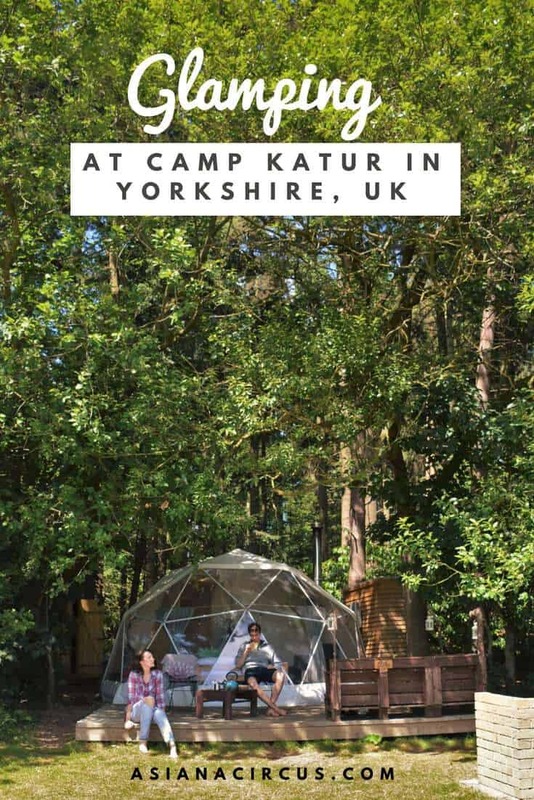 You should definitely take a look at Camp Katur’s website to see the various options you can choose from because every accommodation is unique and has different design, facilities, and located on very different spots around the camp. 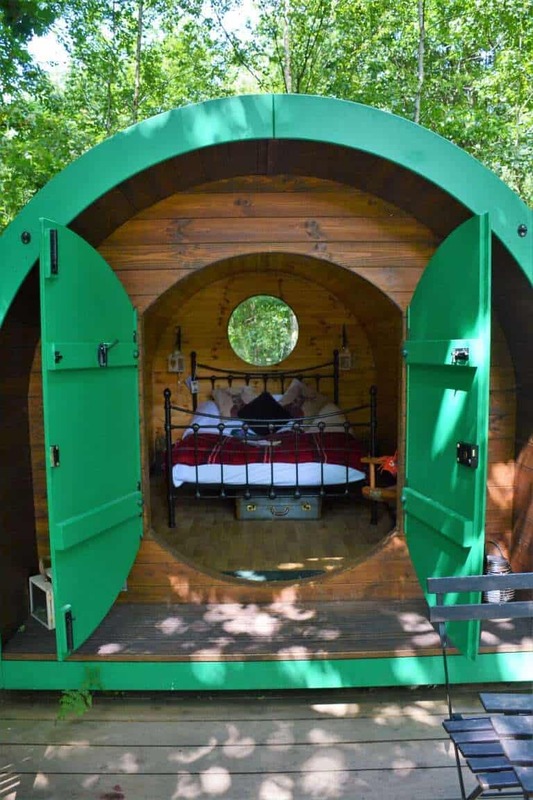 Some are in groups and some are very secluded and hidden in the forest just like a real fairytale pod to give you the ultimate privacy. A couple of them have their own private shower and toilet and the rest come with the communal kitchen and shower. We were happy to discover that the communal areas are just as well kept and beautifully designed as a private one. As you can see there are many things to consider so give yourself some time before you decide and look around on Camp Katur’s website to make sure you book the right accommodation for yourself and your loved ones. 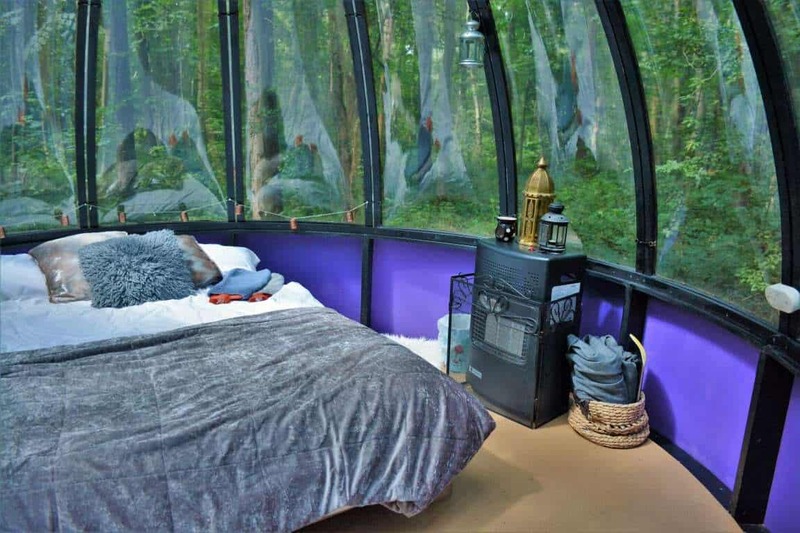 The best part of Glamping in England is that you get to be surrounded by a picturesque nature that inspired thousands of artists J.K. Rowling and J.R.R. Tolkien included. You only need one quick look around and you’ll understand where all the magic is coming from. Long walks in nature aren’t for you? Don’t worry because you will also find many adventurous and fun activities at Camp Katur that are perfect for kids and adults alike. 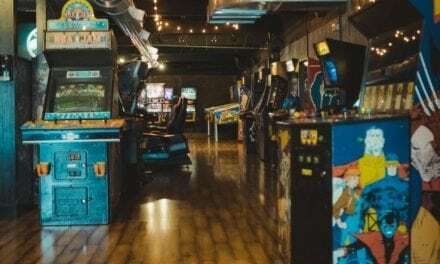 They have various indoor and outdoor activities to make sure you always have something to do. You can go wine tasting, participate in a yoga class or a craft workshop. Do you want something more adventurous? 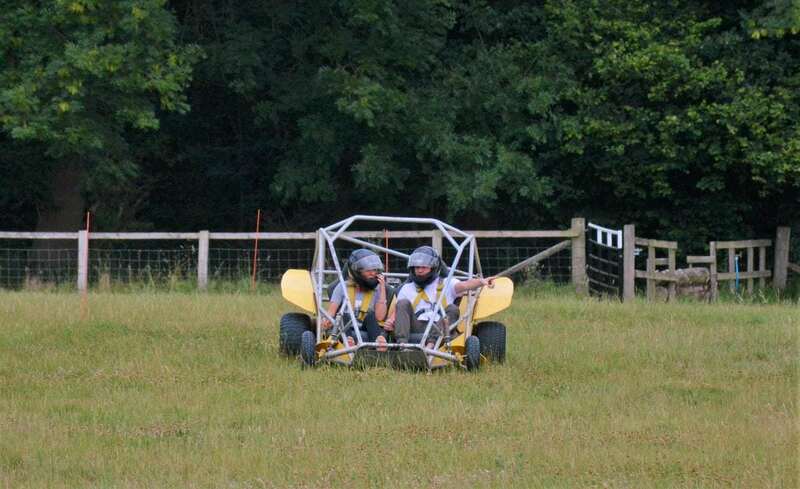 Why not go quad biking, horseback riding, or try the woodland journey and slide down the zip-line. For kids, there is the Woodland Kingdom to burn off energy. 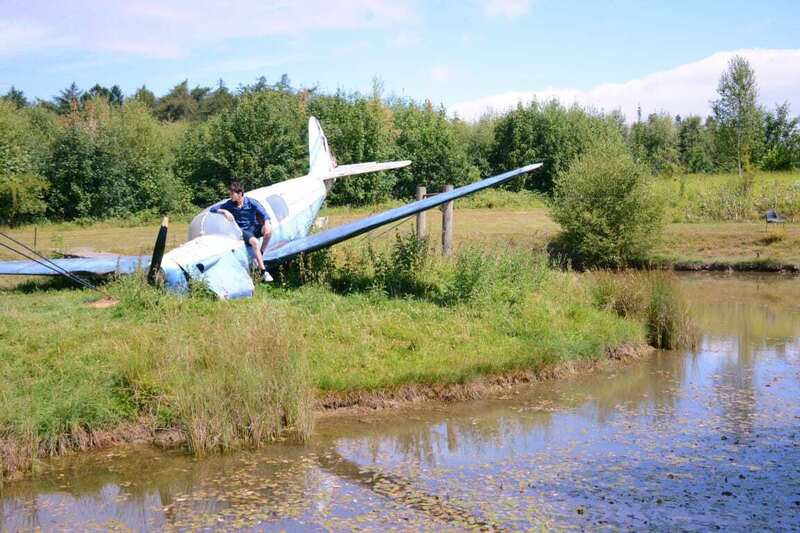 You can also go on a scavenger hunt for the small pond with the crashed airplane in the middle. Wishing for more pampering and luxury? 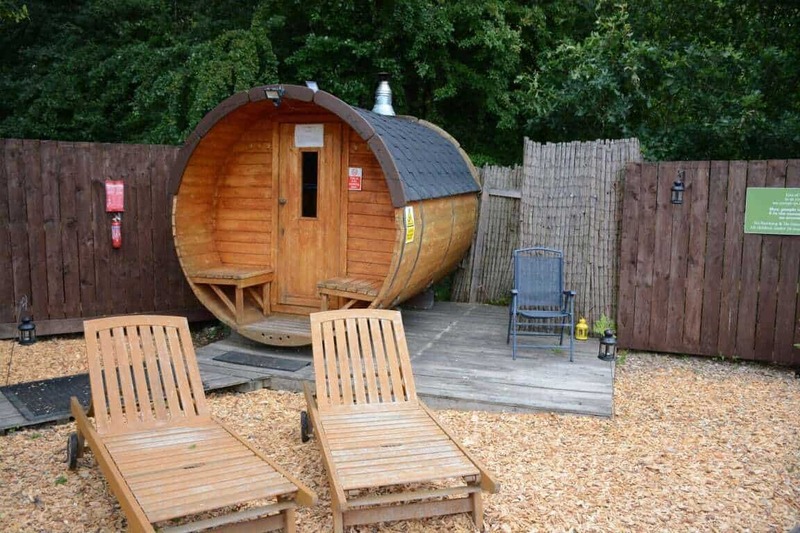 Immerse yourself in the outdoor hot tub and relax in the ECO sauna. Let’s talk about the best part of camping. Food. Campfires, toasted marshmallows, and BBQ. You’ve got plenty of options in Camp Katur if you want you can use the kitchen and cook something special or you can stick to the well-tried camp dishes and roast something or make a nice BBQ dinner. You can also book breakfast and all kinds of dishes in advance with your accommodation. I would like to emphasize the book in advance phrase because that’s your only option. Otherwise, you can always think a little ahead and buy everything you want to make in the following days. 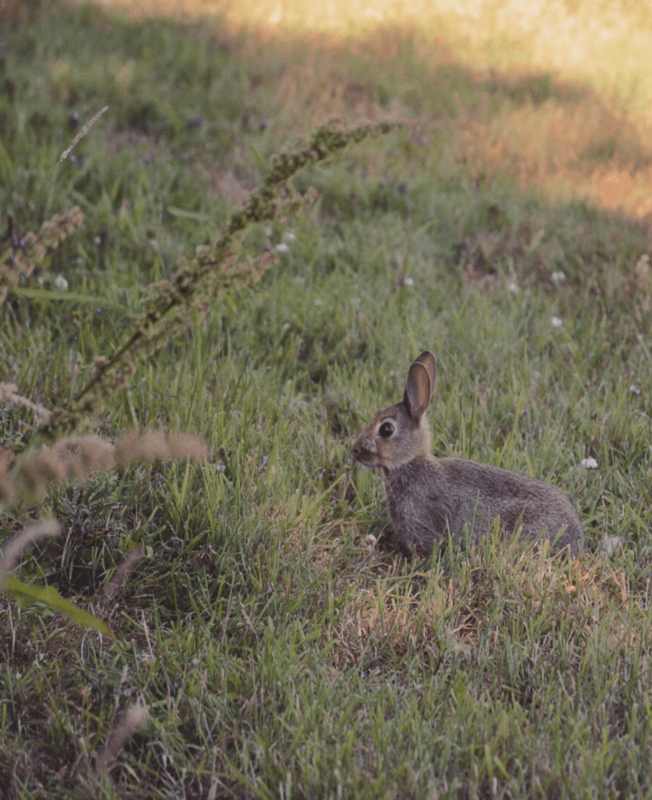 Tip: If you wake up early enough you can see the cutest bunnies hopping around your tent while you’re having your breakfast. 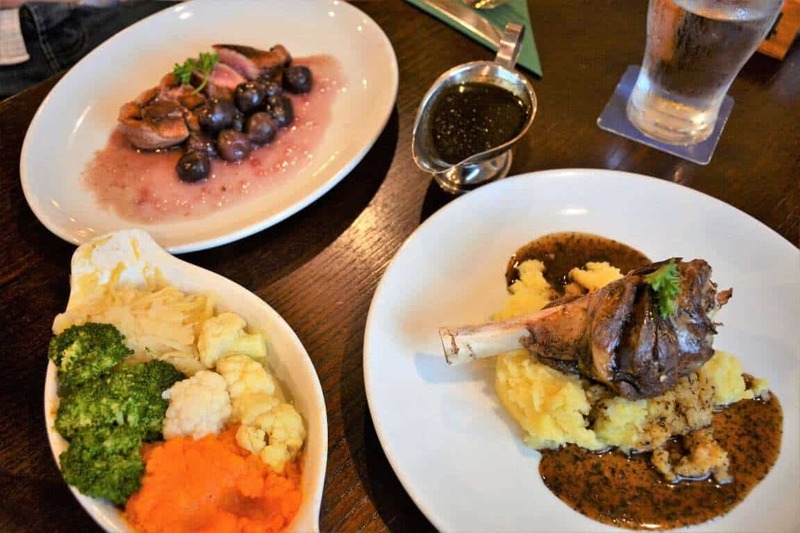 There are also charming small villages in walking distance (about 10 minutes) where you can try some real English dishes with locally produced ingredients. You’ll quickly realize how delicious these meals can be if they are sourced and made properly. 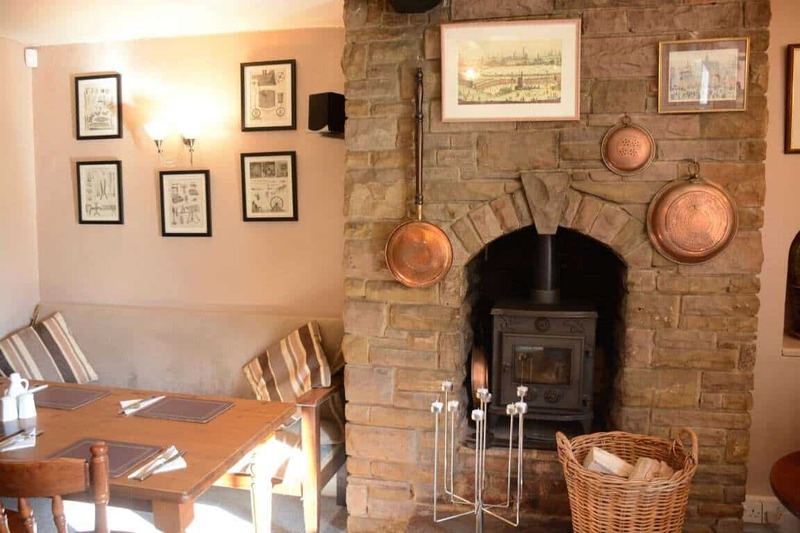 Two of our favorite places were The Black Horse Inn in Kirklington and The Woodman Inn in Burneston. 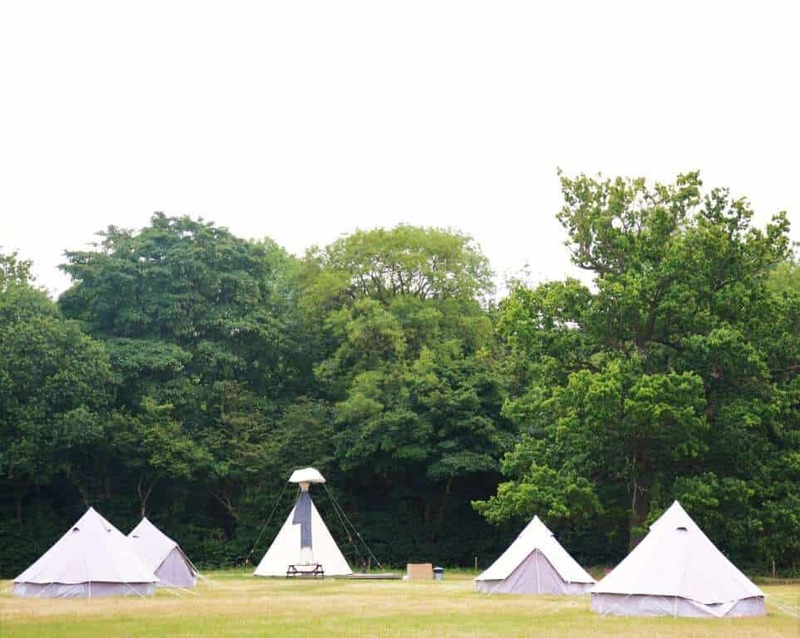 Glamping in Yorkshire is also special because you get to know one of England’s most exciting area, discover it’s cultural heritage, hear about myths, and legends of Vikings. 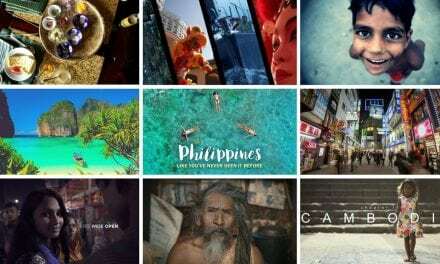 There are literally thousands of places, attractions, and adventures that you can choose from. 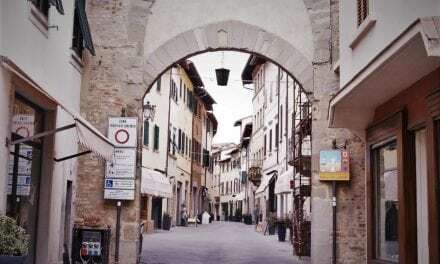 First and foremost I would recommend you to visit and just walk around the neighboring villages and small towns. 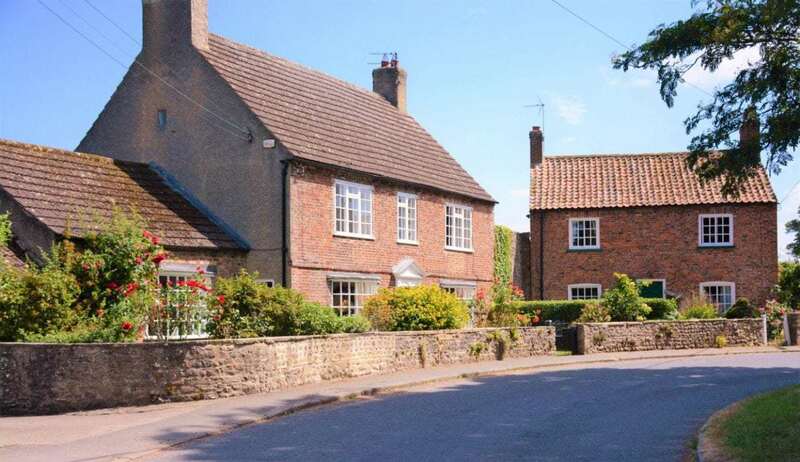 Carthorpe, Burneston, Kirklington are all excellent choices. You will find there charming little alleys and streets, classic English cottages, and the friendliest locals I’ve ever met in England. Don’t miss out on York while you’re here. Some of the most exciting activities are in this gorgeous historic town. You can climb the York city wall, visit the York Castle, and get to know the Vikings’ everyday life better at The Jorvik Viking Centre. The York Dungeon is here to tell you the most terrifying tales of Yorkshire and to entertain the bejesus out of you. 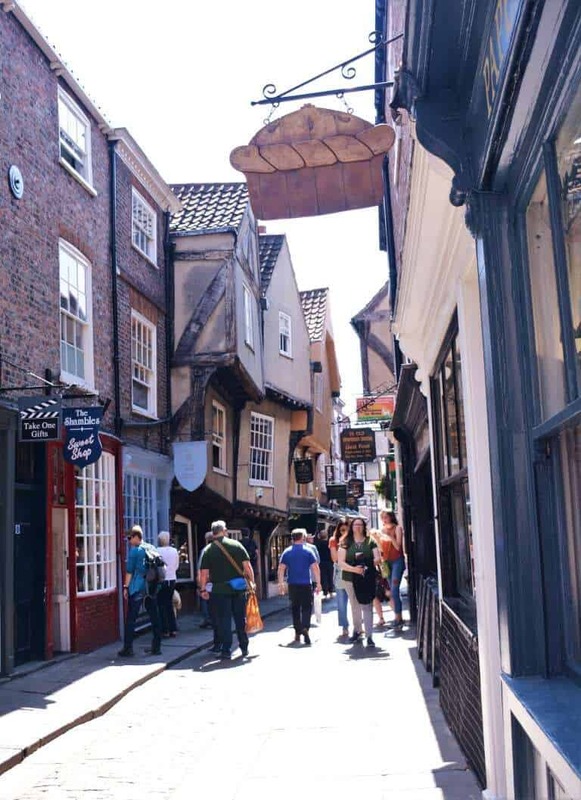 But York’s most beloved and oldest part is the magical Shambles that inspired J.K. Rowling to create Harry Potter’s famous Diagon Alley. 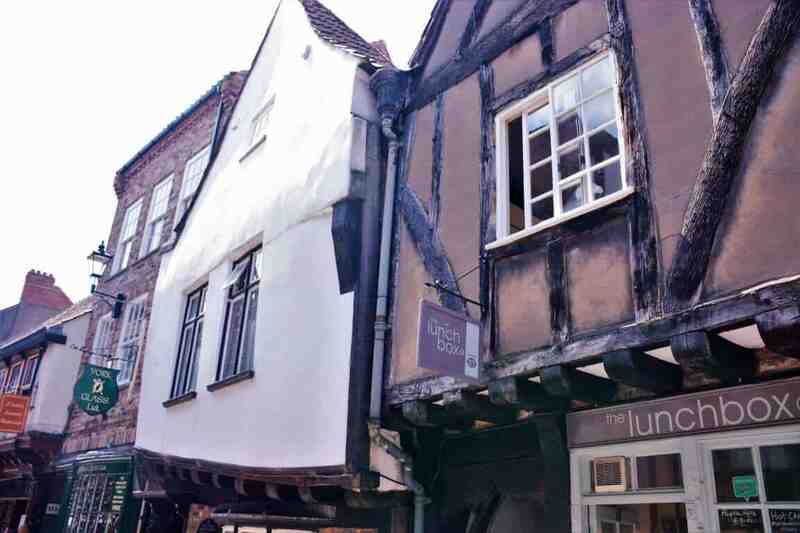 Many streets and buildings of the Shambles date back to the fourteenth century. 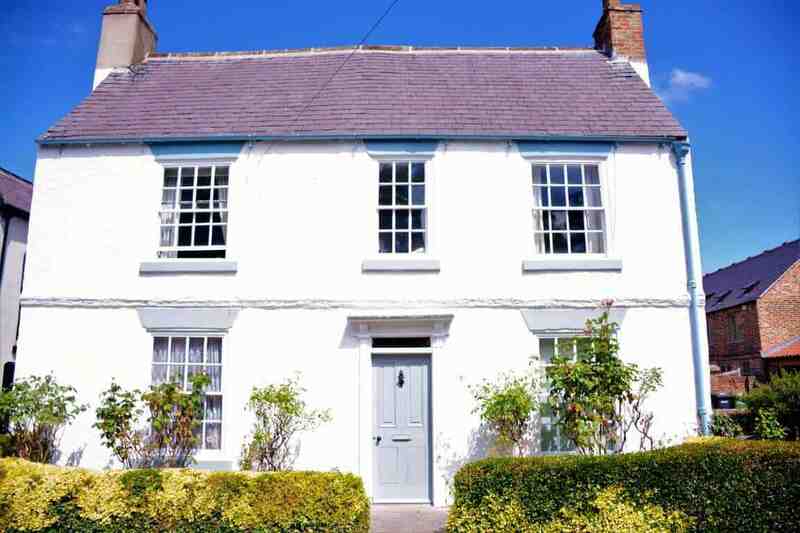 The wonky houses and the narrow cobbled stone streets will make you feel like you’re truly in the world of Harry Potter. There are hundreds of amazing things to do in Yorkshire. You can find more activity ideas on Camp Katur’s site or you can also send them an email to ask for their best tips before your visit. The camp has no electricity. They use solar panels to get the fairy lights working in the tents. I always use a headlamp when I travel because this way my hands stay free. Yes, this means there isn’t wifi and you CAN NOT charge your electric devices on the premises. You can always buy a portable charger and bring it with you to make sure you can charge your phones and laptop. The temperature drastically drops down even summer when during the daytime the weather is usually warm. So, make sure to pack clothes accordingly. While it’s a luxury experience you’ll still be in the middle of gorgeous nowhere considerably far from pharmacies and shops. Make sure you bring enough water and at least a basic first aid kit. Check Out My Neighbourhood Guides for Camp Katur on Arrivedo for more detailed information. Thanks to Camp Katur for hosting us during our stay. As always, thoughts and opinions expressed here are entirely my own. Yes, this place is great! It was an amazing experience!